DO NOT READ IF YOU HAVE NOT FINISHED BOOK TWO!!! SPOILERS!!!! 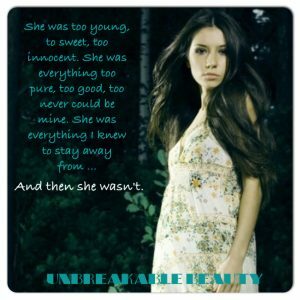 ******DO NOT READ IF YOU HAVE NOT READ BOOK TWO – CHAOTIC BEAUTY … SPOILERS! SPOILERS! SPOILERS! IT WILL RUIN IT FOR YOU!!!!!!!!!!!!!!!!!!! I will say it again! Do not read if you have not read Chaotic Beauty! This post contains SPOILERS!!!! Or you can read it if you want to, I guess. If you are like me, you wouldn’t care. I think I have mentioned it before – I am sure that I probably have – but I am the type that will read the end of the story after I’ve read only a few chapters of a book. Sometimes I will even read the ending first. I always go back and re-read everything leading up to the ending … but I MUST know what I am in store for! But that’s just me. And like I said, this post has the potential to ruin the whole entire book for you if you are not like me. So if you don’t want anything ruined and you haven’t read book 2 (hell, if you haven’t read book 1 there are most likely spoilers for that book as well), stop reading this post and wait until the next one! 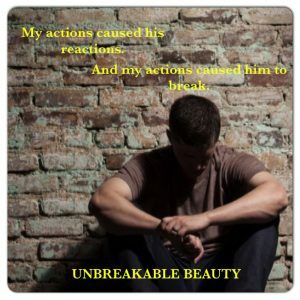 The Epilogue for Chaotic Beauty … How did you like it? I always intended on adding something “special” in there, the same way I did for Unexpected Beauty where I completely changed POVs. That whole book was Samantha, Samantha, and more Samantha, and then wham … Liam had the Epilogue. I wanted to do something along those lines for book two … but what? I mean the book was written in both Riley’s and Connor’s POV’s. I needed something … and then entered Aiden. Once I thought about it I knew that Aiden would get the last word. Or would he? I completed my book, but as I edited, and as I edited some more, as I received the final proof in my hand I still had doubts … did I REALLY want him to end the story? The book wasn’t about him. He shouldn’t have the last words. Sure, it worked. It set up from an outsider’s perspective the love that he was seeing around him. Sam and Liam’s love. Riley and Connor’s love. Even Ryan and Allie’s bond. It wasn’t just Sam and Liam telling you. Or Riley and Connor. It was seen and known by someone else. But Riley’s epilogue ended perfectly for me. Her last line … it encompassed EVERYTHING. I went over, and over, and over it. In the end, you know I kept Aiden’s addition in there. For the reasons I stated before. He was the outsider looking in and telling you they had it all – or they are heading that way. And he wants it too. It was the perfect segue into his story. And from the sneak peek … you know parts of what you are in for if you want to continue along on this journey with me, and with Aiden … and Sam and Liam, Riley and Connor, Allie and Ryan, and Elizabeth. Another thing about the Epilogue was Connor’s portion. I changed the beginning of Connor’s portion literally almost at the last minute! I already had the proof. I already edited numerous times. But it wasn’t until I read the Advanced Reader Copy of it … and I have no idea why I read it again by the way … the book was edited beyond belief by then … but I did, and something bothered me! Like bothered-bothered. Like 3 a.m., middle of the night, waking up because one section bothered me to a point I can’t really put into words and I am a writer. Think about that! It was something that you guys would have never been bothered about most likely. It’s something you wouldn’t probably even care about or remember. Only I would know. But Jesus … there I was, after everything was done – it was already uploaded to Amazon for pre-order, it was already in print version, it was already at Barnes & Noble … and there I was editing, and adding, and coming up with an idea because of one scene that I needed to have. I left loose ends with Rebecca and Brian – that I will address briefly in Loud Beauty so if its bugging you I will get to it at some point … I left a wide open issue of Kyle Ross which does come back around (I THINK … I mean he has to right? RIGHT?!) but it wasn’t any of that. The celebratory dinner. That’s what woke me up. That’s what had me sitting at my computer long after the story was done, finished, shouldn’t have even been a thought for a long while for me anymore. HOURS. It took me hours to change what I had to in order to add those few sentences. It took HOURS for me to write those few sentences because I liked what I already had written for Connor – like I said … I WAS DONE! But I managed to get what I wanted in there and still have everything else. You might ask WHY I did it. Why even bother? Who cares? I did! Remember, Riley was so happy to be sharing a meal using one of her mother’s recipes with Connor. She wanted to share her memories with him. She wanted to include him. She wanted to have a foundation with him and build new memories and include something special. She was preparing for all of that. And then the chaos ensued. And that was the end of it. But I didn’t want it to be the end of it and never get addressed because it was her attachment to her mom, like the earrings. Like Liam’s pitcher vase and his mom quirkiness and how that was such an important thing and moment in his story. When Liam opened up to Sam about the vase it was a turning point in a way … I needed something like that for Riley and Connor … So … We know that by her cooking dinner for him and him addressing it in the Epilogue that she did get her chance to share with him, build with him, etc. 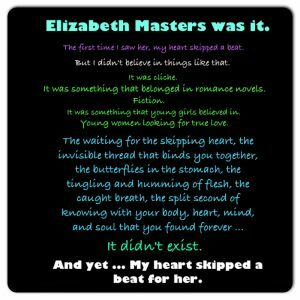 It wasn’t a turning point because by that time obviously they are together, you know that their future is going to be happily-ever-after (it will be happily-ever-after because I am just that type of author and reader!) …. But I needed it in there. Like I said it might not seem big, but for me it was. I needed a Riley & her mom moment. A special moment. More than the birthdays that they shared when Riley and Liam were younger. Something personal she could share with Connor like Liam did with Sam. So … yeah, that’s that. And like I said in another post, you definitely get more Aiden and more Ryan in this book which was done on purpose. During book 1 you only get a few sides of what other people believe to be Aiden and Ryan. You don’t really get to know them. During book 2 I would say you get to know them a lot more … but still, you do not know them yet. Not even close. Nor do you know the women they are going to fall in love with yet. There are so many layers to the remaining couples … Jesus. Only right now am I starting to figure them out. And the surprises are constant. So if I am surprised … I can’t wait until you all read these two remaining books of the series! Anyway … I am currently writing bits and pieces for book 3. I know that I said in another post that the book might be delayed. I honestly don’t know about that. But I would rather say something sooner rather than later. I’ve started compiling quite a bit of scenes that I intend on using in the book, and I am coming up with more and more ideas every day. I think I might be sitting and writing Loud Beauty start to finish before I know it. So we will see how it goes. Right now I am shooting for Summer 2016 …and YES I know that leaves me with a broad date … but as I know with more certainty so will you! Check back here often … or most likely check on Twitter often to see how things are going! I am normally posting on Twitter every day! Anyway …………. Back to Book 2! There are probably a few other things I can talk about that happens in book 2 – like Connor and Riley and what they did when they were apart before she comes back to town … I know some of you might not like what they were up to after the fight. Trust me, I know. There are certain things I HATE reading about in books, and right at the very top of my list is the main characters “hooking-up” with other people and then having to hear about it. Actually, in both of my books I have touched upon a LOT of things that normally drive me crazy when I am reading books … and wow I ended up doing it to other people. When I started thinking about Connor and Riley’s story, I didn’t know that that is where I was heading with Riley coming back. I knew they got into a huge fight. I knew she had to go back to school. I didn’t know what would bring her back home to stay though. I partly knew that Connor would revert back to his old ways and I knew I needed to figure out why, how that would affect anything, would it even affect anything … I didn’t know how it would all end up being until it was actually pouring out of me and onto the pages. I also didn’t know I was going to have that scene after the prologue comes back around towards the end of the book and Riley’s at the hospital. I had NOTHING written down for that specific scene and I am a person who has notes and whole scenes and outlines galore everywhere. I mean I have whole scenes written for Book 4 (scenes that I am in LOVE with by the way) and I haven’t even truly started in depth on book 3!! Connor was only supposed to get shot in the arm or the shoulder. Nothing overly bad was supposed to happen. He wasn’t supposed to leave my laptop keyboard wet from the tears I was shedding as I wrote and re-read and edited certain things. UGH!!!!!! How about that though? Connor stole my heart long ago in Unexpected Beauty (yes, he definitely did and I know some of you don’t understand why he’s my favorite but that’s okay! ), and he kept my heart firmly in his grasp even when I felt like kneeing him something fierce at times (Heather and Riley’s birthday springs to mind) … but what he’s thinking before that whole scene when he makes up his mind to protect Riley …. Jesus. I will always have a special place in my heart for Connor. Wow. I think I need to go back and re-read that whole section. I truly do love me some Connor! But now it is time for Connor to step a smidge to the side to allow room for Aiden. I am not quite sold on Aiden yet but I am getting there (and it’s not as awful as it seems! I like a man of mystery, I like a complex man with layers, I fully plan to enjoy getting to know Aiden!). And once I am fully and truly there I will begin to write him in earnest. He deserves it. You deserve it. And so do I, considering I’ve lived in this world with them rattling around in my head for well over a year! Soooo … I feel like I’ve jumped back and forth on you guys a lot with this post. I feel like I started out wanting to say a lot about book 2 and yet I don’t feel like I touched upon nearly half of what I wanted to say, but time for me has run out because I have other things to do right now! SOOOOOOOOO if you would like to know something specific I didn’t talk about, ask me … my contact info is on the contact page of this website. Email me. Tweet me. FB me. I’d love to answer your questions! Though beware … I’ve been told I write a lot! Ha! Until next time everyone! I hope all is well! COMING SOON – THE SEASONS SERIES!! !